There are just four qualifications for "perfect" bacon. It's got to be thick, not too fatty, not too salty, and has to inspire an unconsciously uttered "yum" after the first bite. 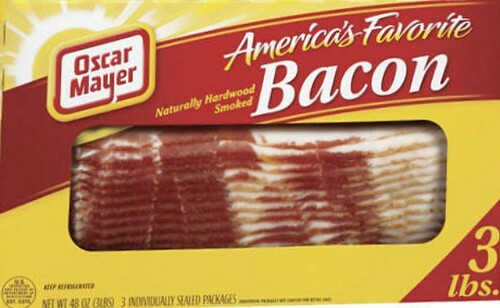 Oscar Meyer claims to be America's favorite bacon, and indeed it's pretty tasty. But it's just not thick enough. I like "slabs" of bacon! It is very good, but I'm on a Safeway boycott because they proudly celebrate gay pride month every year. This quest has not been without its trials, burdens, and discouragement. There've been some real ups and downs. The darker days included the bacon so thick it was like a fatty pork chop. The low point came when the house was perfumed with the glorious aroma of bacon, but the strips were so salty our lips cracked. After my last purchase resulted in Sahara-desert-mouths and Lipitor-qualifying-cholesterol levels, I almost gave up. But then I... I found it. 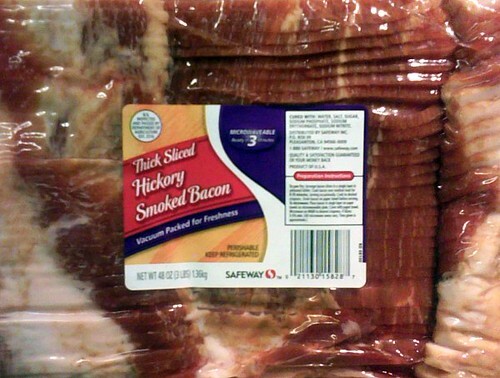 The holy grail of bacon. It's thick. It's not too salty. It crisps nicely but is equally good chewy. And best of all... I unconsciously yelled out "YUUUUM!!!" after the first taste. But it's not nationally available. It's a NW thing.